The new Yankee Freedom III is a high-speed, state-of-the-art, all aluminum $3 million Catamaran. Her design is recognized worldwide for performance and stability. She is New England-built and was launched in February, 1999, then sailed to Key West and put into service the following March. The Yankee Freedom II Catamaran is equipped with the latest and most sophisticated safety, navigation, and communication equipment. She has undergone a thorough U.S. Coast Guard inspection and will do so each year.. The Yankee Freedom II will take you to the Dry Tortugas National Park and back again at a speed of up to 30 m.p.h. 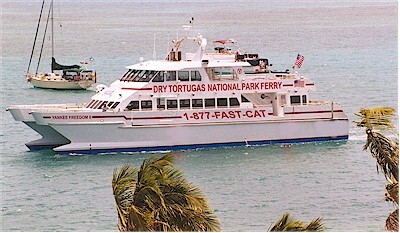 with safety and comfort like no other ferry operating out of Key West today. The upper deck is open to the sea air and sights and sounds of marine life. There is spacious sundeck seating with areas to stretch out in and enjoy the sunshine and the view. Also topside there's a convenient cocktail bar with protective covering. The large, completely air-conditioned cabin has comfortable cushioned seating and large windows all around. High-tech television and VCR are available for your pleasure. Here is the complete modern galley where the complimentary breakfast of fresh foods and juices are served at sea and a delicious complete lunch served at Fort Jefferson. A snack and cocktail bar are open at other times during the voyage. Also on the main deck are fresh water rinse showers and three seperate restrooms. The Yankee Freedom II Catamaran is powered by twin Caterpillar engines that give her a speed of over 30 miles per hour, making Yankee Freedom II Catamaran the fastest vessel of her size out of Key West. 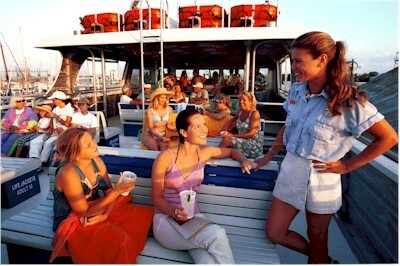 Aboard, you will reach the National Park boundaries within 2-1/2 hours after leaving Key West harbor. Also below decks are two generators plus a multitude of machinery and equipment to operate the vessel in the safest, quietest, and most dependable manner possible. Yankee Fleet is most experienced. Its vessels have been taking thousands of visitors to the Dry Tortugas since 1977. You will be cared for by our seasoned skippers and a friendly, efficient crew. You will be guided and entertained by our award-winning naturalists. The people of Yankee Fleet look foreward to meeting you and making your trip to the Dry Tortugas National Park and Fort Jefferson enjoyable and memorable.